Arcade Video Game published 35 years ago by Exidy, Inc.
A vector graphics game mounted in a huge sit-down cabinet that actually swiveled and spun about. Vertigo, produced roughly two years before prior to "Top Gunner", is thought to be its prototype. Vertigo was shopped around but never picked up due to poor location test results and excessive hardware costs. About 150 units were reportedly built but most were given away to operators as part of a revenue-sharing program. 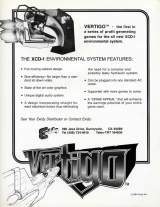 While Exidy had produced an earlier game with the name Vertigo (an Owen Rubin game that was eventually released as "Tunnel Hunt"), this is a different game.